WOW, what a month, most of you are flying at the moment. What with Langham, Dedham, Pleshey, Ipswich, Great North Run, Parkruns and a couple of marathons thrown in, you are riding high. I say most of you as I know a couple of you are nursing injuries and would love to be out there running. Rather than hide it in the small print, I need to apologise to Debbie and Lynsey for missing their achievements out of August’s newsletter. Lynsey did the Harwich Olympic Distance triathlon in an impressive time and Debbie got a pb over 5km at Clacton. At least 14 of you got a pb or a parkrun pb in September, some of you in more than one distance. These include Steph, Sam G, Anna M, Clare R, Clare G, Claire F (TOO MANY CLARES!! ), Ruth, Bee, Gemma, Caroline, Sue S, Eileen, Lesley, Lynsey, Nicola Thorton. 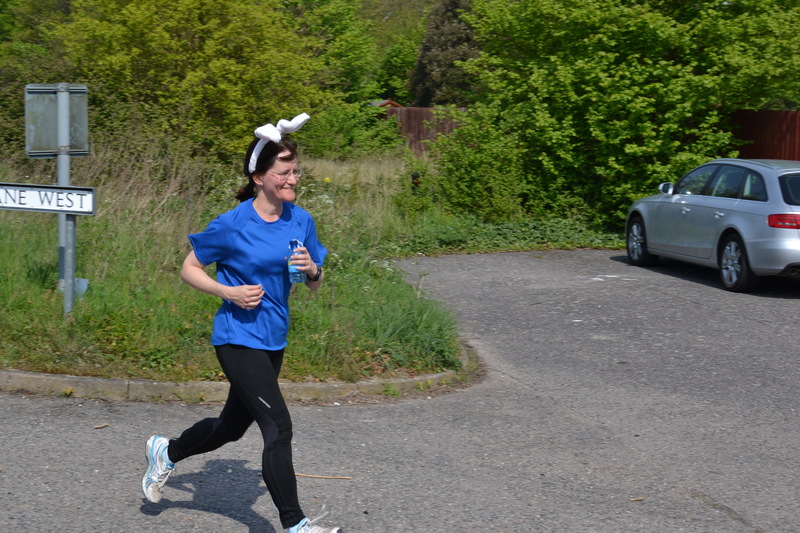 Must mention Sue Thomas too who got a pb in training!! There may be more……. It wasn’t just pbs, you kept Eric busy on his printer with those standards. In the case of Eileen, who after doing Pleshey as a training run before Berlin, realised she still bagged a gold standard. Steph just managed a smile through her flowing tears when she realised she smashed her gold at Pleshey. Clare F returned after a long break from running due to injury to bag a bronze standard for her first 10k. Unfortunately it sounds like the Ipswich half course was not a course where any of you were going to get a pb or a standard. Our golden marathon girls, Sam and Eileen, shone this weekend at Nottingham and Berlin – both should be very proud of their achievements, both of them coming back even stronger after suffering from injuries over the last year. In terms of the Essex Championships, the ladies are still holding their own in some of the age categories with a fight on our hands to try to hold on for the last 2 races at Tiptree and Chelmsford. Lex came away with a bronze medal for her age group at Pleshey, her first Essex medal. Great Bentley ladies are still second in the series. Ironically we also have a ‘B’ team in the table where we have enough ladies to field another team so the more the merrier at Tiptree and Chelmsford. Still spaces for Tiptree but it closes next Sunday or when 500 entries is reached. Good to see some old faces returning – welcome back Claire F and Gemma, Rebecca and Karen R after taking the summer off and Willow with a huge smile on her face after climbing Kilimanjaro. By the time I write the next report, the first Cross Country will be over which is at Witham on 26 October. I am not around for the first one but I will be back for the rest. The boys are really strong this year and we are too, as long as you don’t stay at home!! However Cross Country is not all about scoring, it is about spending your Sunday morning with a bunch of friendly people in the middle of nowhere eating lots of cake. I will also send an email out soon about the GBRC Juniors as we field a Junior Team (8 to 15 year olds), very excited about their prospects this year as we have a bunch of kids who actually enjoy XC. Newcomers always welcomed. The nights are drawing in and winter training begins. However lots of sessions available to keep us running and training. Clive is looking at doing some indoor sessions as well – more info to follow. So to my runner of the month, I had my eye on her last month but she was pipped by Sam. However, she would be the last person to tell everyone how well she has been running. However this month after her stonking run at Pleshey, everyone noticed. Therefore for her sheer hard work in training, her step up in her racing, her silver standard and a massive pb, SUE SORRELL is runner of the month for September. A big well done.